Under a buttonwood tree on Wall Street beginning in 1792, men gathered to exchange the stocks of the day. On the first evening of the 2013 NYC Climate Week and nearing the 1st anniversary of super storm Sandy, corporate America gathered on the floor of the New York Stock Exchange to trade ideas and thoughts about climate change, environmental conservation and the business of sustainability. Buy and sell orders were replaced with drink orders to celebrate the S&P 500 Climate Change Report launched by the Carbon Disclosure Project, a nonprofit who has become the global standard for institutional carbon emission and sustainability reporting. The report, written by Pricewaterhouse Cooper, demonstrates how the business sector is addressing climate change and realizing opportunities that contribute to increased company valuation. Environmental sustainability is emerging as a mainstay of business success, no longer just a surface effort to show a green side. Corporate America has discovered that implementing sustainability principles into business practices need not be a head wind to success. The CDP report indicates carbon emissions reductions can be decoupled from growth: Data show a 6.3% reduction in emissions from 2012, while S&P 500 company growth and US GDP grew 15.8% and 2.8%, respectively. The recent UN IPCC report says scientists are 95% certain that humans are the “dominant cause” of global warming. Climate change has become a serious factor in long term business planning and made a front burner topic by super storm Sandy. 77% of CDP respondents report risks related to climate change and a survey with Accenture showed that 70 percent of the 2,415 companies polled believed their revenue would be significantly affected by a changing climate. Rising sea levels, changing crop seasons, storm damage, power supply disruption, water security; a short list of factors for company risk management. With crisis come opportunity, 78% of CDP respondents cited business opportunities related to climate change. Support for climate policy is focused: 80% of respondents (up from 70% in 2012) are engaging in climate change policy; of those that are in support, the majority favor energy efficiency and clean energy generation. In the words of Sir Richard Branson, who knows something about making money, “Climate change is a huge opportunity…..the fight against greenhouse gases offers huge opportunities for profit.” Increased focus on corporate sustainability is a long term investment in fighting and living with climate change. For any company wanting a cost effective way to expand their contribution to sustainability, look no further than educating children on the subject. For each child that learns about environmental conservation there is a multiplier effect. As a school kid is educated on the subject, she changes her personal habits as the normal (and sustainable) way to live; unplugging not in use electronics, recycling, not buying disposable water bottles, etc. At home she will question her parents on what she learned at school; “why did you leave the light on? ….. Why is the car running while we sit in the parking lot?” The family changes their habits and carbon footprint. A company that commits to supporting school sustainability education will have new momentum to re-evaluate and invigorate their own environmental initiatives and daily actions. A company supporting sustainability in schools is a long term investment in fighting and living with climate change. 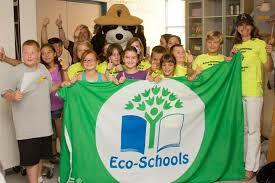 Eco-Schools USA is a program that integrates sustainability principles into K-12 schools and curriculum. Through the Eco-Schools program National Wildlife Federation is dedicated to forwarding and expanding the initiatives of environmental responsibility, STEM education and sustainability. This program is designed to educate the next generation of conservation leaders. The Eco-Schools outline overlays very well with most corporate sustainability initiatives; energy, recycling, water conservation, transportation, composting, waste reduction, etc. In 2300 schools across America, Eco-Schools reduced greenhouse gas emissions by 53 million pounds in 2012. NWF is partnering with companies to support school sustainability education. To a corporate partner it is a long term investment opportunity to fight climate change, expand sustainability footprints and develop the next environmental leaders.